"It's time to clean up this country, death to all collaborators, so-called leaders and supporters of the campaign of guerrilla Gustavo Petro." Leftist politician Gustavo Petro almost became president of Colombia last month. But the killing and threatening of his supporters is making a future run virtually impossible. One of the latest victims of the deadly violence that is targeting all kinds of social leaders was Ana Maria Cortes from Caceres, a small town in the northwestern Antioquia province. Cortes was shot to death last week, becoming the fifth Petro campaign worker to be killed this year. 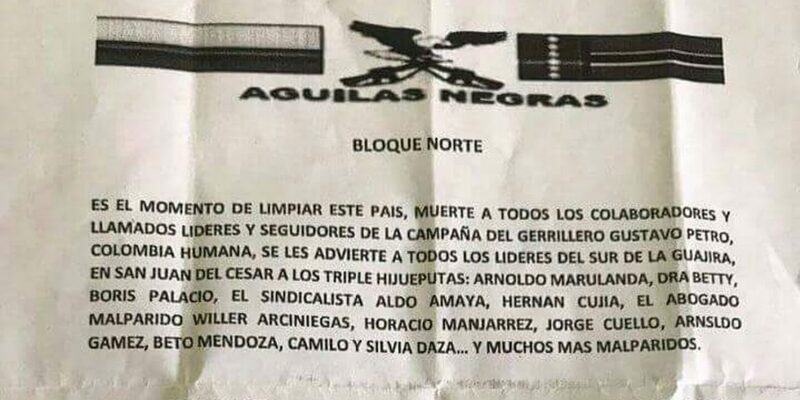 Death threats, often signed by the elusive “Aguilas Negras,” have been sent to multiple of the former presidential candidate’s campaign offices. “There’s an extermination plan,” Petro’s campaign chief, Jorge Rojas, told Blu Radio last week. The former candidate has called on all his supporters to protest on August 7, the inauguration day of President-elect Ivan Duque, the conservative dynasty politician who defeated Petro in the first elections after the demobilization of what used to be the country’s largest guerrilla group, the FARC. Colombia’s peace process kicked off in December 2016 after a peace deal that saw the demobilization and disarmament of 14,000 people. The historic agreement, however, triggered an increase in murders of political activists like Rincon, human and civil rights defenders, victim representatives and other social leaders. In the first half of 2018, 123 leaders were assassinated, according to think tank Indepaz. This is more than in the same period in 2016 when the FARC was still in arms. Following Duque’s election on June 17, the bloodshed escalated even further; a leader has since been killed every day. According to Colombia’s chief prosecutor, Nestor Humberto Martinez, the majority of the killings are related to drug trafficking. Defense Minister Luis Carlos Villegas said last year the murders were often related to relationship troubles. Authorities have been adamant in denying the existence of paramilitary groups that murdered thousands and virtually exterminated a leftist political party in the 1980s and 1990s. But hardly anyone believes the minister, because of the state’s role in the political persecution of the left and the murders of popular politicians. The truth is a lot more complex, according to both think tanks and the UN. “We see a lot of cases … related to the defense of land, the opposition to mega-projects or complaints about illicit crops,” UN human rights chief Alberto Brunori told newspaper El Tiempo. According to the top UN official, his office was investigating the five assassinations of Petro supporters. 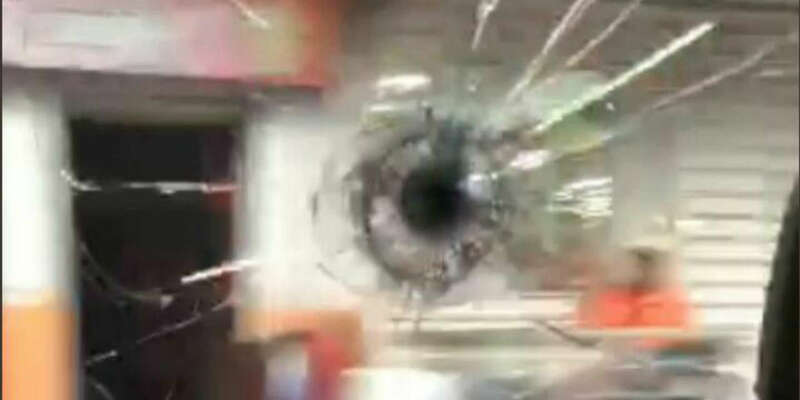 The attackers in Cucuta had been incited by a far-right ally of former President Alvaro Uribe, Duque’s political patron who is investigated for the murder of a human rights defender, among other things. In only 13% of the cases, the killings appeared to be related to the cultivation of coca, the base ingredient of cocaine, said the think tank. Petro, leftist organizations and minority groups insist that part of the violence is entirely political and carried out by a new generation of far-right extremists. The Aguilas Negras threats appear to confirm this. The violence is threatening Colombia’s peace process that did not just seek the demobilization of the FARC, but increased political inclusion of the left and minorities in general. But if political campaigning becomes a life-threatening activity and is done under a terror threat, it would be difficult any leftist candidate to drum up support.